U.S. singer Katy Perry said she and boyfriend John Mayer will often go an entire day without talking at the home they share to rest their voices. The singers both need frequent vocal rest, especially Mayer, who recently suffered serious vocal-cord problems, People magazine reported Friday. DeGeneres suggested the two begin playing Pictionary. “We should just learn sign language,” Perry said. Please follow TMW on Twitter and connect with M.A. Cassata on Facebook. As she announced in her appearance on today’s episode of The Ellen DeGeneres Show, Katy Perry has added a second show at the Staples Center in Los Angeles that will take place the night after her sold-out November 22 show — this one free to thank fans for their incredible support throughout 2011. The November 23 “Katy Perry Gives Thanks” show will wrap up the global superstar’s sold-out 122-date California Dreams World Tour. For information on how to join Katy for this special event, visit www.facebook.com/katyperry between now and November 14. The show will be filmed so fans are encouraged to recreate their favorite Katy Perry look as they may be featured on camera. Katy appeared on The Ellen DeGeneres Show to debut the video for her current single “The One That Got Away,” directed by Floria Sigismondi. Coldplay’s Mylo Xyloto (Capitol Records) enters The Billboard 200 at No. 1, becoming the band’s third consecutive studio album to debut atop both The Billboard 200 and the U.K. album chart as No. 1 rankings continue to come in from around the globe. Mylo Xyloto has also set the record for the highest first week album sales ever on the iTunes Store worldwide – a milestone Coldplay first achieved in 2008 with the release of Viva La Vida. In the U.S., sales across all formats totaled 447,000 according to Nielsen SoundScan. Dolly Parton‘‘s new single “Together You & I” is now available for streaming on her official Facebook page located here http://www.facebook.com/dollyparton. Dolly recently debuted the single during a performance on The Ellen DeGeneres Show, which can be seen here http://ellen.warnerbros.com/music/dolly_parton/. Dolly Parton‘s highly anticipated new album Better Day is set for a June 28 release date through her own Dolly Records, which is distributed through Warner Music Nashville. To coincide with the album’s release, Dolly will launch a world tour bringing her throughout America and then onto the U.K. and Europe in August and September, then Australia in November in support of the new album. 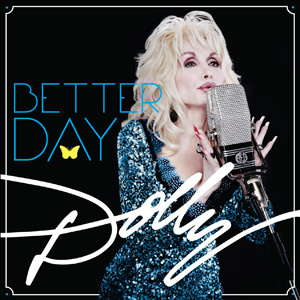 Better Day is the follow-up to Dolly’s critically acclaimed and successful 2008 Backwoods Barbie album. Featuring 12 original compositions, Better Day marks the fourth release on the independent label.